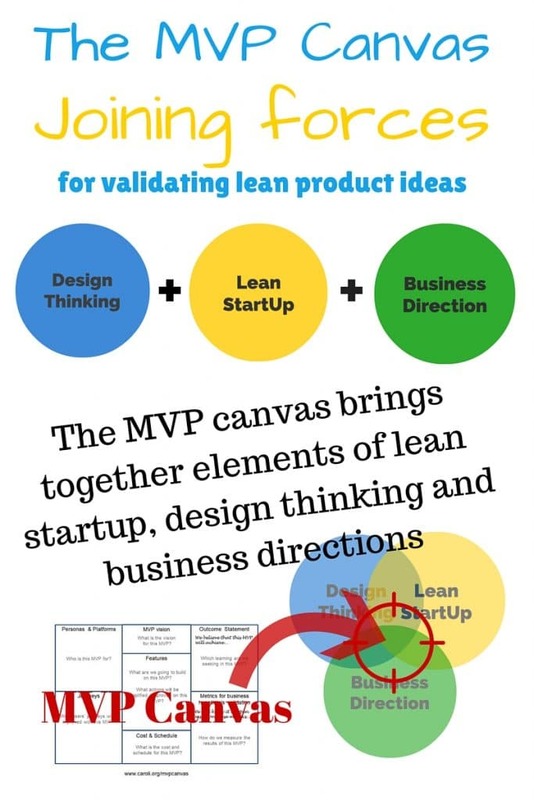 The MVP Canvas is a lean startup template for validating new or clarifying existing lean product ideas. 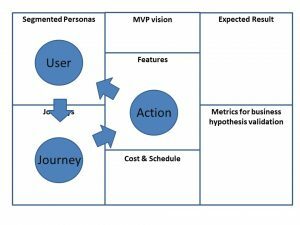 It is a visual chart with elements describing a MVP—minimum viable product´s vision, business hypothesis, metrics, features, personas, journeys, and finances. It assists entrepreneurs in aligning their ideas with the underlying (minimum & viable) work to create and validate it. The MVP canvas brings together elements of lean startup, design thinking and business directions. From Lean Startup, we have the build-measure-learn loop. This loop is represented by the features under construction (build), the results (learning), and metrics to validate the assumptions (measure). The following questions are raised by this loop: What are we going to build on this MVP? How do we measure the results of this MVP? Which learning are we seeking in this MVP? Who is this MVP for? Which users´ journeys will be improved with this MVP? What actions will be simplified / improved on this MVP? These questions are “human-centered” – that is people-oriented. These are typical questions upraised by the design thinking approach, a human-centered method for creative problem solving and innovation. Regardless of applying lean startup and design thinking, an entrepreneur’s plan must be up to a standard that supports the business direction. 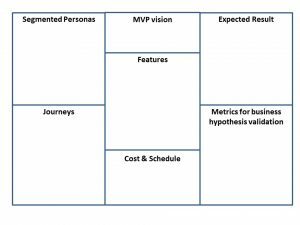 Your MVP canvas must answer these two business questions: What is the vision for this MVP? What is the cost and schedule for this MVP? MVP Proposal – What’s the Proposal for this MVP? Segmented Personas – Who is this MVP for? Can we segment and test this MVP in a smaller group? Journeys – What journeys are going to be improved with this MVP? 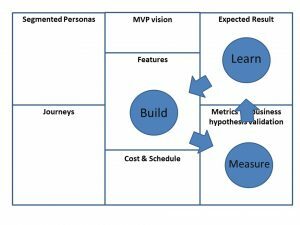 Metrics to validate the business hypotheses – How can we measure the results of this MVP? Expected result – What learning or result we are seeking in this MVP? Features – What are we building in this MVP? Which actions are going to be simplified or improved in this MVP? Cost & Schedule – What is the expected cost and due date of this MVP? When can we look at the data for validating it? Is there any schedule constraint?